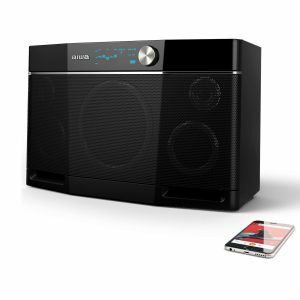 Aiwa Exos-9 is one of the most popular and highest rated battery-operated (portable) Bluetooth speakers on the market. Exos-9 is not a high-end speaker but judging by the reviews and ratings on the Amazon, you might get the impression that it is. Aiwa Exos-9 is a nice-looking and quite large Bluetooth speaker. It’s portable and you can use it outdoors but be aware that it’s not rugged or waterproof. One of the things that make this speaker special is the number of drivers. People from Aiwa managed to install five drivers (2 midrange woofers, 2 tweeters, and 1 subwoofer) and some high-quality crossovers inside this speaker. You won’t see that many drivers in a Bluetooth speaker that often. Most of the today’s Bluetooth speakers have woofers in charge of reproducing low and midrange frequencies but Aiwa decided to take a different approach and use both subwoofer (for lows) and 2 midrange woofers (for mids). The combination of these drivers and crossovers is the main reason for such a clear, balanced, and loud sound. This is also the main reason why you can find Aiwa Exos-9 in our list of 10 Loudest Bluetooth speakers and in the list of 20 Best Sounding Bluetooth Speakers. The sound quality is what made Aiwa Exos-9 so popular but it’s not the only good thing about this speaker. The battery inside the speaker is pretty good (but there are some confusing things about the battery we are going to discuss). 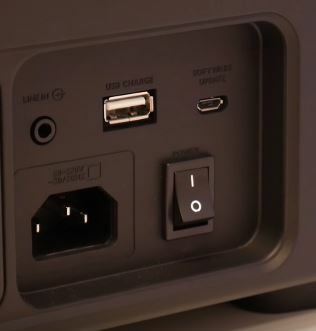 We also liked the facts that Exos-9 features USB powerbank port for charging phones/tablets and that you can customize the EQ settings by using onboard EQ controls. Exos-9 can be paired wirelessly with another Exos-9 speaker and you can choose between 2 modes – dual stereo and stereo separated (we are going to explain these two modes later). Most of our complaints are related to build quality (too much plastic) and to control panel design. Aiwa Exos-9 is more of a stationary desktop speaker than an outdoor speaker. It is portable and wireless (built-in battery, handle, Bluetooth-enabled) and it delivers very pleasant and balanced sound but it’s not as rugged as some other Bluetooth speakers and it’s not waterproof so the number of situations in which you can use it outdoors is limited. If you need a great sounding and very loud Bluetooth speaker that’s going to be used mostly indoors (whether for parties or for casual listening), Aiwa Exos-9 is a great choice. Exos 9 comes in a large illustrated box. Inside the box, you will find your speaker, large lithium-ion battery (it’s replaceable and rechargeable), power/charging cable, auxiliary audio cable, user manual, and 2-year warranty. Considering the price, we have expected some nice additional equipment but you will have to buy all the accessories and equipment separately. Aiwa offers a carrying bag for Exos-9 and a remote. You can also buy the extended battery (it doubles the playtime) if you want. 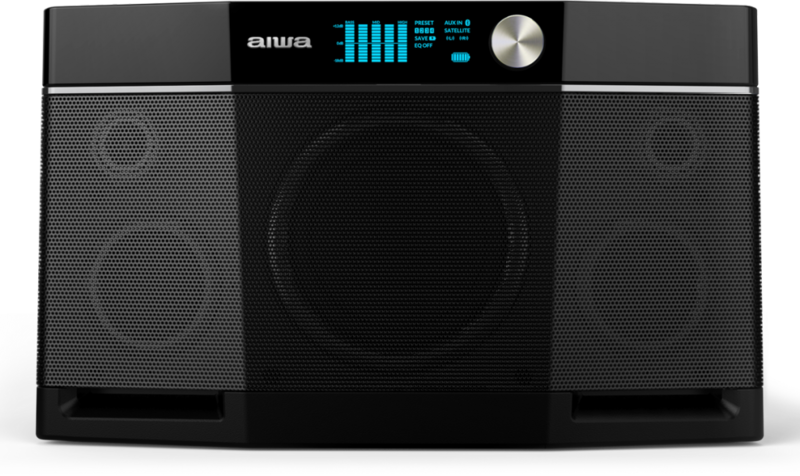 The new Aiwa company adopted the old-school boombox design. 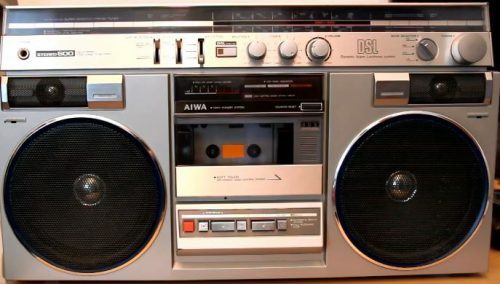 Maybe they wanted to pay their respects to famous Aiwa boomboxes or to match this well-known name with a well-known design and make the product recognizable. They also managed to modernize this retro design and make it more visually appealing to new generations. The largest part of the front panel is covered with a removable and transparent aluminum grille that protects those 5 drivers we’ve talked about. You can leave the grille on or remove it – it all depends on your taste. Right at the top, there’s an LCD screen where you can see the EQ settings and presets, battery status, and selected source (AUX or Bluetooth). Right next to the LCD screen, there’s a large volume knob. On the rear panel, you will find a carrying handle (at the top), large bass reflex port (for improved bass response), battery compartment, and input ports. Exos-9 features AUX input, USB powerbank port for charging, micro USB port (you can use it for firmware updates only), AC input, and ON/OFF switch. There’s a beautiful touch-sensitive control panel on the top. There are 7 buttons on the panel – play/pause, EQ with 4 arrow buttons (you can use them to shift between different presets and to customize 5 different EQ bands), and LINK button (for pairing two Aiwa Exos-9 speakers wirelessly). Right next to the control panel, you will see the NFC logo for quick pairing (works with Android devices). If these controls are not enough, you can buy that remote we’ve talked about and get more control over the playback. Aiwa Exos-9 is a battery-operated speaker. The battery is not built into the speaker and it can be removed and replaced. The speaker uses one lithium-ion rechargeable battery. The battery can deliver up to 9 hours of playback time at moderate volume (approx. 50%) but only 3 hours at maximum volume. There’s one confusing battery-related topic we would like to discuss. In the specs list on the Aiwa’s website, you can see that the battery capacity is rated at 2,600mAh and they also sell the extended battery with 4,400mAh capacity. On the other hand, the specs list on the Aiwa Exos-9 box states that the capacity is 15,600mAh. You can find the same numbers (15,600mAh) on the battery itself. Considering the size and number of drivers inside the speaker and the playtime, 15,600mAh seems more believable. 2,600mAh is simply to small for this kind of speaker. Besides, USB powerbank port would be useless if this was the actual battery capacity. To put things in perspective, Samsung S9 features 3,000mAh battery while iPhone X features 2,700mAh battery. The USB powebank port can be used for charging phones or tablets. Assuming that the capacity of the battery is 15,600mAh, you can fully recharge Samsung S9 or iPhone X 5 times. Exos-9 can be connected to different audio sources (phones, tablets, PCs) via Bluetooth or via AUX input. The speaker features support for A2DP (Advanced Audio Distribution Profile) and AAC, aptX, and SBC audio codecs. It also supports fast pairing thanks to the NFC feature (it can be used for pairing with NFC-enabled Android devices). It is also possible to pair two Exos-9 speakers together thanks to the LINK feature. The control panel and LCD screen are also nice features but their placement could’ve been better. The manufacturer decided to place the control panel on the top while the LCD display is located on the front panel. Placing them both on the top panel would make the speaker more user-friendly. We don’t have too many complaints regarding the performance. The Bluetooth works as advertised. Pairing is simple and quick. If you have an NFC-enabled Android device, you can use that NFC quick pairing feature (simply tap the NFC logo and you are ready to go), and if you have an iPhone, you will have to go through the standard pairing steps. There was an issue regarding the Bluetooth connection in the past – anyone within the Bluetooth range was able to ‘’hijack” the speaker but Aiwa made a patch (firmware update) and solved this issue. You can now lock the connection by pressing LINK and RIGHT ARROW buttons on the control panel or by pressing the lock button on the remote (the one that you have to buy separately). The Bluetooth range is approx. 50ft without obstacles (20-30ft with obstacles). We haven’t experienced compatibility issues – Exos-9 works with Android, Apple, and Windows devices. It can also work with non-Bluetooth devices thanks to the AUX input. The manufacturers usually advertise the playtime without offering any info about the volume at which the playtime was measured. Aiwa was more honest than other manufacturers – they claim that you can get up to 10 hours at 85dB (but it’s really hard to tell what is 85dB since the volume level is not displayed on the LCD screen). We have managed to get 9 hours at 50% volume but only 3-4 hours at full volume. The battery life and playtime depend on the volume but also on the type of music (bass heavy music means more subwoofer movement which further means shorter playtime). The controls are both good and bad. The fact that there are four EQ presets and that you can customize the sound by adjusting 5 different EQ bands is awesome. You can also use the controls to play/pause the music or increase the volume but there are no dedicated track buttons. You can find those buttons (as well as lock/unlock buttons) on the remote but you have to pay extra for it. Also, we would like to note that touch-sensitive buttons are not always responsive (it’s nothing serious or alarming – you will occasionally have to press the button twice). Sound quality is probably the best thing about Aiwa Exos-9. If you are searching for a balanced and loud sound, and you want a battery-operated Bluetooth speaker, then Exos-9 is one of the best choices. The bass is powerful and punchy but controlled. The mids are very detailed and dynamic, and highs are perfectly clear. You will get this kind of neutral sound signature when the EQ is off. If you want bassier sound, or if you want to emphasize the voices and midrange, you can play with EQ presets and those adjustable EQ bands (+/- 12dB) and find the type of sound that you like. Exos-9 is also very loud. It’s one of the loudest Bluetooth speakers on the market (max SPL is rated at 100+dB) which makes it great for parties. The distortion is almost nonexistent and the bass stays controlled and it doesn’t overpower the midrange even at full volume. If you need even louder sound (for parties) or slightly better stereo separation, you can also pair two Exos-9 speakers together by pressing the LINK buttons on both speakers. They have to be less than 20ft away from each other. 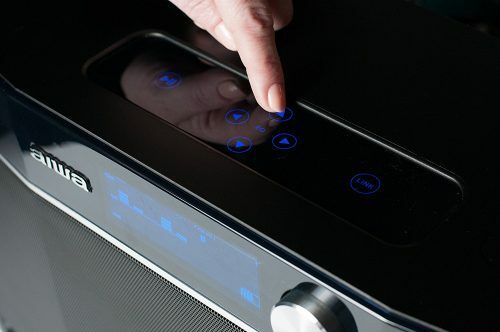 There are two modes available – dual stereo (for louder sound – both speakers will play the same audio), and stereo separated (for better stereo separation – one speaker acts as the left and the other as the right audio channel). To, conclude Exos-9 is one of the best sounding Bluetooth speakers under $350. If that’s your limit, you won’t find more balanced and louder sound for your money. Peachtree Audio deepblue3 and Exos-9 are similar in many ways – they have the same boxy design, the number (as well as the size and placement) of drivers is the same, and they have similar dimensions. They are also priced the same. Deepblue3 features digital optical input while there is no digital input on the Exos-9. Also, the Bluetooth range is slightly larger on deepblue3. On the other hand, deepblue3 doesn’t have the battery and it has to be plugged in all the time. The sound signature of both speakers is very similar but you can make EQ adjustments with Exos-9 while you can’t do that with deepblue3. Also, you can pair two Exos-9 speakers together while you can’t do that with deepblue3 speakers. JBL Boombox is much more rugged than the Exos-9 and it’s actually waterproof (IPX7). 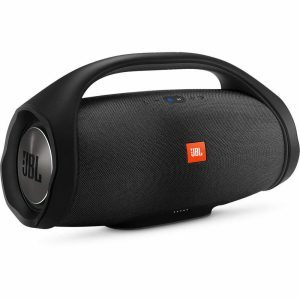 If you need something that you can take with you wherever you go, JBL Boombox is a much better option. They both have large batteries (Boombox – 20,000mAh, Exos-9 – 15,600mAh) but JBL Boombox delivers much longer playtime (22 hours compared to 9 hours) because it has 4 drivers (+ 2 passive radiators) which are smaller than the drivers on Aiwa Exos-9. When it comes to the sound, it all depends on your taste but Aiwa Exos-9 delivers much more balanced and more natural sound while JBL Boombox is more bass-oriented. Exos-9 is also louder but you can only pair two Exos-9 speakers together while you can pair up to 100 JBL Boomboxes. Exos-9 features EQ settings and JBL Boombox doesn’t. JBL Boombox is more expensive and can be controlled with an app (there’s no app for Exos-9). 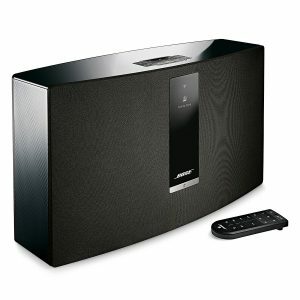 Bose SoundTouch 30 and Exos-9 have similar design and size (but SoundTouch 30 is much heavier). They both support Bluetooth wireless streaming and that’s about it when it comes to similarities. Their primary purposes are completely different. 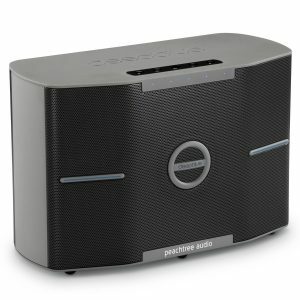 SoundTouch 30 is a wi-fi speaker (Exos-9 only features Bluetooth). Soundtouch 30 is designed to be part of your multiroom speaker system. SoundTouch 30 features Alexa support and allows you to stream any audio content from your devices via your home wi-fi network. Also, SoundTouch 30 has to be plugged in all the time while Exos-9 is battery-operated and portable. When it comes to sound, we prefer Exos-9. It delivers much fuller, richer, and more powerful sound than the SounndTouch 30. In the end, the only thing that matters is what you need. If you need a powerful, loud, rich, and well-balanced sound, Aiwa Exos-9 is one of the best choices. Exos-9 is portable, it has a large battery, and can be used outdoors but it’s not rugged enough or waterproof. If you need something that you can use by the pool, Exos-9 is not the right choice. If you want something more rugged and waterproof, you should buy some other speaker (JBL Boombox, for example). Unfortunately, you will never get the same loudness and sound quality with JBL Boombox (and you will have to pay more). If you grew up in the ‘70s, ‘80s, or ‘90s, you have probably heard of Aiwa already. Aiwa was a big name in the audio industry back then. They were very famous for their boombox cassette players/recorders and radios. Aiwa was an independent Japanese company during the ‘80s and ’90s but they didn’t manage to survive the transition from analog to digital age. So, the speaker we are presenting to you is not made by that well-known audio manufacturer. 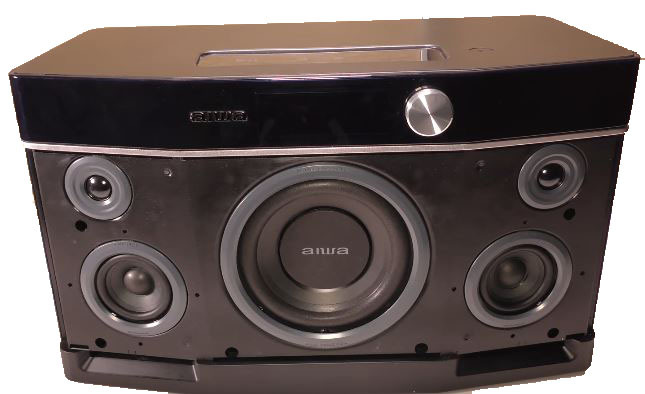 In 2002, Sony bought Aiwa and tried to revive the once famous brand. Unfortunately, Sony failed and discontinued the production of all the Aiwa audio equipment in 2006. The brand was dead for 5 years but then, an American businessman called Joe Born bought the rights to use the Aiwa trademark and founded a completely new audio company. 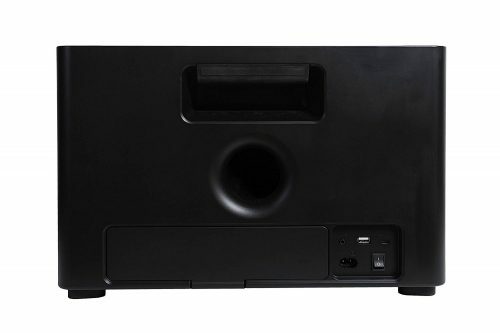 This Exos-9 Bluetooth speaker is manufactured by this new company established in 2011. After a few years, we can say with confidence that Exos-9 represents a successful revival of the famous Aiwa brand. PrevFloor Standing vs. Bookshelf Speakers – Which Is Right for You? Does exos 9 have lithium battery? I want to buy it for a present and I ask you this because I want to travel on an airplane with this speaker. Exos-9 does have a removable Li-ion battery, but you should check the aviation regulations and airline policies before you schedule your flight. Cargo with Li-ion batteries has been banned on passenger flights since 2016 and Li-ion batteries are considered dangerous goods. This ban applies to checked baggage but it doesn’t apply to carry-on luggage, so the airline personnel might ask you to remove the battery and bring it with you as part of your carry-on luggage. That would be the best-case scenario. They could also ask you to ship the speaker on a separate cargo flight. Anyway, you should check the regulations and contact the airline customer service for further information. i just love the little something about yourself section.I believe in every word, it shows so much strong and clear. how the battery actually lasts depending on volume on exos 9).I hope this thing of yours grow more people like me need something like this to read up on. Thank you for your kind words. We hope your Exos-9 will serve you well for years.